Here is a selection of the finest yachts (A LOT OF) money can buy. Ibiza and neighbouring Formentera have become a mega yacht magnet in the Mediterranean. From sports stars to oil tycoons to circus moguls, this piece of Balearic paradise is a platform for the super-rich to show off their impressively sized vessels. Take a walk down the port of Ibiza Town and you'll see row-upon-row of the finest yachts money can buy, and, maybe one day, you'll have your own, but until then you'll have to make do with staring from afar or even charter a boat for a day, which will be shorter in size, but still big on luxury. The Russians are coming. But this isn't the Cold War, it's the yacht war. Here are six of the best which pass by Ibiza. Having come straight through a Stargate, this megalodon of a yacht looks it's about to swallow up everything in its path. Simply named Sailing Yacht A, this beast is owned by Russian moneyman Andrey Melnichenko. When UFC star Conor McGregor is in awe on Instagram, you know you have something spectacular. Another Russian-owned one, Hermitage is your classic 21st century super-yacht. Steel magnate Anatoly Sedykh is the proud proprietor of this one and it can often be seen sailing around Talamanca in mid-season. With a beach club, jacuzzi, gym, swimming pool and gym all on-board, Lady Lara resembles a holiday resort rather than a boat. Kazakh billionaire Alexander Machkevitch usually flies in on his private jet before taking to the sea. With all that hard travelling you can see he needs that jacuzzi. You've earned it, Alexander. With a value of €400million - or four Eden Hazards to football fans - Chelsea owner and Russian business tycoon Roman Abramovich is no stranger to splashing his €11 billion net worth. Eclipse is the second biggest yacht in the world (only eclipsed by €180 million Azzam). With nine decks, this vessel has everything - including a disco hall! That'd be one serious Pacha after-party. One of Abramovich's previous watercrafts, Le Grand Bleu has been spotted on more than one occasion around Ibiza's coastline. It was reportedly won in a bet by Eugene Shvidler from Roman himself. That must have been some night in the pub, if true. It's rumoured that Andrei Skoch from (you'll never guess...) Russia owns Madame Gu (well, apparently his wife does, according to the Panama Papers leak). Its sleek exterior shimmers perfectly in the night, so you'd have no problems finding it in the port after a few evening hierbas. It even has a helicopter hangar that opens-up like something in a sci-fi movie - and it doubles up as a squash court. Smashing. 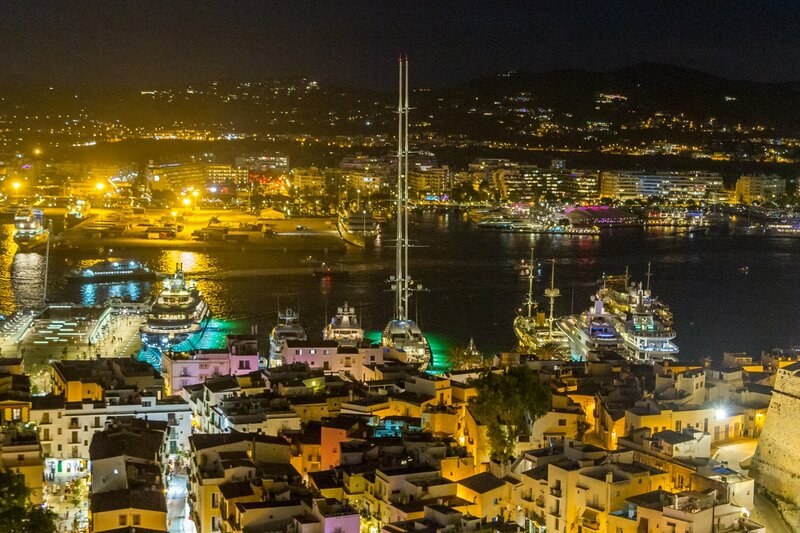 And there you have six of the best yachts to see in and around Ibiza. Every day, especially in peak season, sees yacht-upon-yacht-upon-yacht pour into the island's port. Grab a pair of binoculars (not that you'd need them judging by the size!) and keep your eyes open. You may spot a hot celebrity or two; more likely it'll be an overcompensating Russian middle-aged billionaire, though. So don't get your hopes up. As we say, you can have a slice of this life by chartering a boat to take your to Formentera or around Ibiza - make sure to wave at the billiionaires as you sail past.